Today Activision announced the details of the figure available exclusively at E3 2013. It is a Bronze Hot Dog. 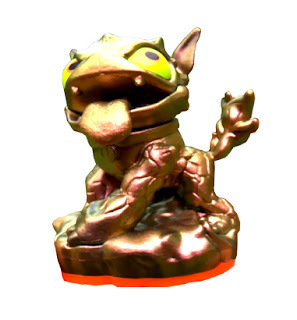 The Chrome Spyro from E3 2012 sells for more than $150 and the 2011 variations sell for $700-750. One sold just yesterday for $721. If you are attending E3 this year be sure to stop by the Activision booth and ask about the Bronze figure. The Skylanders Figure will probably be the most valuable swag you get at the entire show. the line was super long for this. if time is money it would be cheaper to buy this on ebay. @anonymous - That is a good point. In 2012, Activision just gave them to some people if you asked the right employees who knew about it. It was much more hush, hush. This time Activision publicized it and made a game of handing them out. Anyone could wait in line and spin a wheel to see if they won. There was a 1 in 4 chance of winning and you could go back and start the line over again if you didn't win. The stories I have heard say the line was about 15 minutes to 45 minutes depending on time of day and day of the show. If the line was 15 minutes, the average person would expect to wait in line 1 hour to get the Bronze Hot Dog. They are selling for about $150 right now. So that would be pay of $150 an hour. If the line took 45 minutes then you would need to wait 3 hours to get a figure, which would be $50 per hour. Still very good pay, but that is also time you can't enjoy other games and swag opportunities at E3. So there is some major opportunity cost as well.